Dan Mangan has a history of engaging a crowd despite the most challenging weather. During the folk festival, the crowd's spirited involvement on the most searing day of the summer threatened mass heat stroke; last night's concert in the midst of a particularly brutish winter storm overrode frostbite, wind chill and deadly road conditions. It's a testament to the ever increasing popularity of this affable musician that we all fought our way through gridlocked roadways to make it to the sold-out show. Knox United Church is always a wonderfully intimate venue, its dark wood glowing in the warmth of stained glass that looks benevolently down upon congregated hipsters, but last night, while the wind whipped the endless snow into eddies and polished the roads to glass, the church felt more like sanctuary than ever. Tickets for this concert were sold as assigned seats, which was fortunate since we only managed to arrive mere minutes before the beginning of the show. But what good seats! Third row, in the little alcove to the right of the stage. From that vantage point we had to sacrifice some of the resonating acoustics and impressive visuals of the stained glass, but we had perfect sightline of everything that was happening on stage. And quite a lot happened on stage, as it turned out. The Crackling opened the evening with a short set. The trio are all members of Dan Mangan's band, with the drummer swapping his kit for a guitar and lead vocals. He has an impressive voice too, big and booming, not unlike Mr Mangan's himself. A cute touch happened when Dan joined them on the drums for Keep Me Drunk, much to the delight of the assembly, and then later complained about the Crackling's crappy drummer. And in a move that established precedent and mood for the entire evening, we ended the set on a singalong. I was really excited to see The Burning Hell again, after having been charmed and delighted by their wonderfully subversive performance at the folk festival this summer. During our conversation at the folk festival, Dan cited the Burning Hell, when I had pressed him to name his favourite act of the weekend. That they were now touring together was rather heartwarming to me. It was evident that there was a great deal of mutual love and respect happening, as was evidenced by Dan's pronouncement at the end of the night, arms outstretched, voice booming out to the congregated "I am so in love with the Burning Hell!" This Peterborough band, fronted by the deeply baritoned and diminutive Mathias Kom, plays highly engaging and wickedly humourous songs with an absurdist twist. But these aren't mere novelty songs; if you didn't understand the language, you would think you were just listening to some really compelling music. I had a moment during the Burning Hell's set, while they played the ballad Remote Control, when I was transported. Warm lights illuminated the suited men on stage, rapt faces of those seated were upturned and bathed in what felt like candlelight. I was acutely aware that there was a storm roaring outside the walls, and the room felt like a haven on a windswept prairie night, with the band performing at a dance in some long forgotten prairie hall. And when Darcy began playing an achingly lovely waltz on the cello, the moment was perfect. And then we all had a singalong. 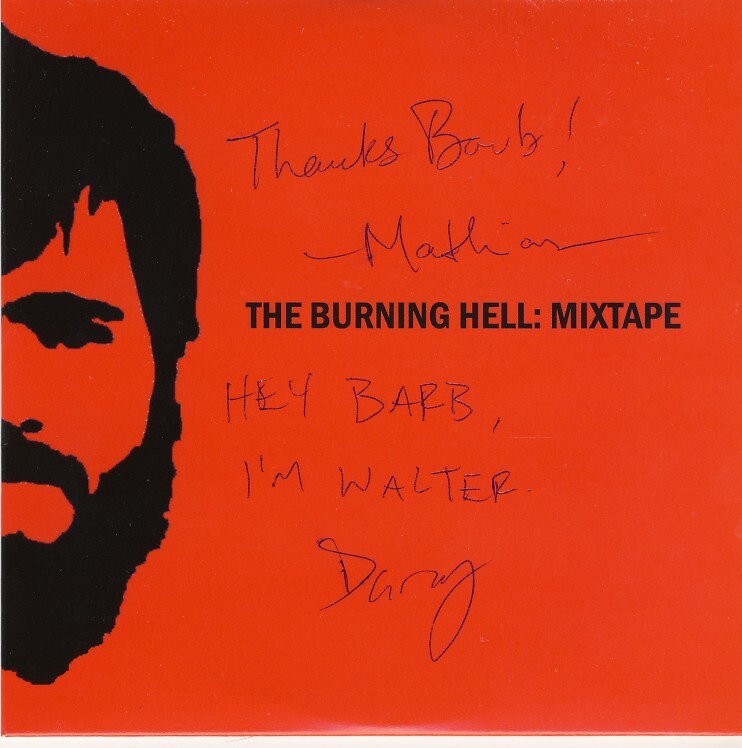 I met with the Burning Hell in the lobby during the break, had a lovely chat with them, and received the most uniquely autographed CD of my life (see above). Dan Mangan performed with a full band, complete with stand-up bass and horns, which made for a larger and more robust sound than I had heard on previous occasions. It's obvious that, after so many years of touring solo, he really enjoys playing with other musicians. The joy was evident in the enthusiasm with which they attacked each song. Those songs with a rock bent were decidedly even more rockish last night. There was still the touch of the troubadour in the music, but there was also musicians playing off one another and even a great glorious cacophonous jam. A particularly nice side story was the tale of the forgotten concert posters. Earlier that evening, Dan Mangan and his band had been guests on The Homestretch, the local CBC radio drive home show. In the course of the radio program, somebody realized that the special silkscreened posters that had been designed specifically for the Calgary show had been left behind in Edmonton. Tweet were sent out, in addition to an over the airwaves announcement, that if anybody was willing to drive the posters from Edmonton to Calgary (in the raging snow, mind you), they would be welcomed at the sold-out concert with kisses and swag and a place to stay and likely even have somebody's first born named after them. And some brave (or possibly foolhardy) soul did come through. Such is the power of music. And Twitter, evidently. The set ended in what has now become tradition, with a rollicking singalong version of Robots, complete with The Burning Hell back up on stage, and eventually winding their way through the audience while Dan walked the backs of the pews, arms held aloft, conducting. The significance of this pew surfing was not lost on me. But if one singalong ending is good, two is better. The night's encore culminated with the band stepping away from their mics for an even more intimate singalong. At Dan's invitation, the audience left their seats and gathered at the front of the stage ("so that our voices can lift together") and everyone sang together on the final chorus. If church was always like this, I would sign up. All that and a waltz on the cello too! You lucky little devil. You always make that Knox United Church sound so wonderful. No doubt they look absolutely nothing alike but it always reminds me of the beautiful stained glass dome in Moose Jaw's Zion United Church. 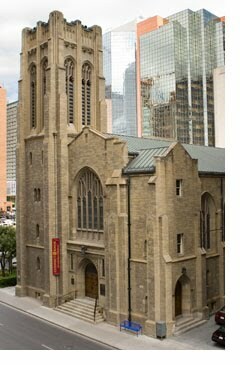 Burning Hell at the United Church?? The cello waltz was one of those perfect moments that will always stay with me, Toccata. Next time I am in Moose Jaw, I will need to do more than wave at the moose statue and check out that dome. The United Church is the cool kid amongst churches, John. I'd go back to church, too, if that kind of stuff went down there. Wow. I love this review Barbara. Excellent, excellent read that was. Thank you for braving the extreme elements to bring us the play by play. I really, really want to see a show there now. Maybe Dan Mangan should start a church, WC. He's got the pew-surfing thing down pat. That can be arranged so easily it's not even funny, Sean. All it takes is a tiny little 4-hour flight. You might be force fed spicy food and red drinks as well. Dan is playing out in MR this spring at the Arts Centre. I am hoping I can go, from your reviews it really seems as though he puts on a fabulous show. I love a good sing-a-long! I bet it will be a lovely show, Al! The hometown ones always have that extra sentimentality to them.